Today I am going to tell you about SBI Clerk Preliminary Cut Off. As you are aware the dates of SBI Clerk Exam has been postponed. However the exam is still very near and it is the right time to discuss about the SBI Clerk Preliminary Cut Off. 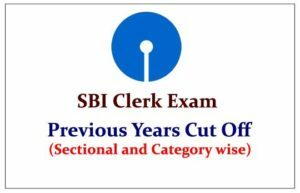 SBI Clerk was last conducted in the year 2016. The pattern of the exam was almost similar. This SBI has made slight changes in the overall exam patter. First I will discuss with you the prelims cut off of the 2016. Subsequently I will also add the cut off of the earlier years as well. However it would be appropriate to discuss about the cut off of 2016 which is the most recent exam before the exam of 2016. The Exam Pattern of SBI Clerk has undergone a change this year. Therefore it is likely that the cut off will also change. With the increase in competition and number of students appearing in the exam, the cut off is expected to increase. You must understand that cut off always depends on two important factors. First, the number of students appearing in the examination and the second, level of the exam. If the number of students is high the cut off will increase. Level of exam also plays a crucial part in determining the cut off. If the level of the exam is high the cut off will decrease. As far as SBI Clerk Examination is concerned we have observed that both the number of candidates as well as level of exam are increasing. Therefore it is very much likely that the cut off will increase further this year. So if you are preparing for SBI Clerk Exam, my tip is to give your best effort and do not take this exam lightly.